Attorney General Loretta E. Lynch, Assistant Attorney General for National Security John P. Carlin, FBI Director James B. Comey, U.S. Attorney Preet Bharara of the Southern District of New York, U.S. Attorney Paul J. Fishman of the District of New Jersey, Assistant Director-in-Charge William Sweeney of the FBI's New York Field Office, Special Agent in Charge Timothy Gallagher of the FBI's Newark Field Office and Commissioner James O’Neill of the New York Police Department (NYPD) announced that Ahmad Khan Rahami, aka Ahmad Rahimi, has been charged in the U.S. District Court for the Southern District of New York and the U.S. District Court for the District of New Jersey, for conducting and attempting to conduct bombings in New York City and various locations in New Jersey on Sept. 17, 2016, and Sept. 18, 2016. 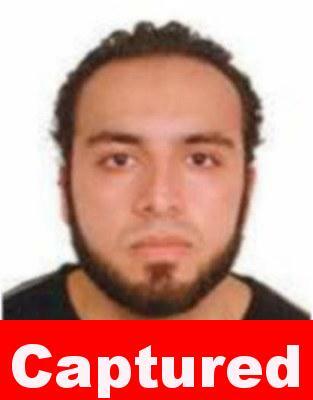 Rahami, 28, of Elizabeth, New Jersey, is charged in a complaint filed in the Southern District of New York with one count of using and attempting to use weapons of mass destruction, in violation of 18 U.S.C. § 2332a, which carries a maximum sentence of life imprisonment; one count of bombing and attempting to bomb a place of public use, in violation of 18 U.S.C. § 2332f, which carries a maximum sentence of life imprisonment; one count of destroying and attempting to destroy property by means of fire or explosive, in violation of 18 U.S.C. § 844(d), which carries a maximum sentence of 20 years in prison; and use of a destructive device in furtherance of a crime of violence, namely, the use and attempted use of weapons of mass destruction, in violation of 18 U.S.C. § 924(c), which carries a mandatory minimum consecutive sentence of 30 years in prison, all in connection with Rahami’s alleged detonation of an explosive device and efforts to detonate explosives in New York City. Rahami is also charged in a complaint filed in the District of New Jersey with two counts of using and attempting to use weapons of mass destruction, in violation of 18 U.S.C. § 2332a, which carries a maximum sentence of life imprisonment on each count; one count of bombing and attempting to bomb a place of public use and public transportation system, in violation of 18 U.S.C. § 2332f, which carries a maximum sentence of life imprisonment; one count of attempting to destroy property by means of fire or explosive, in violation of 18 U.S.C. § 844(i), which carries a maximum sentence of 20 years in prison; and two counts of using a destructive device in furtherance of a crime of violence, namely, the use and attempted use of weapons of mass destruction, in violation of 18 U.S.C. § 924(c), each count of which carries a mandatory minimum consecutive sentence of 30 years in prison and, if convicted of both counts, a mandatory sentence of life imprisonment, all in connection with Rahami’s alleged efforts to detonate explosives in Seaside Park, New Jersey, and Elizabeth, New Jersey. Rahami will first be transported by the U.S. Marshals Service, pursuant to a writ of habeas corpus ad prosequendum, to the U.S. District Court for the Southern District of New York to face the charges filed in the Southern District of New York. More than 30 people were injured as a result of the detonation of a bomb in the Chelsea area of New York City. Assistant Attorney General Carlin and U.S. Attorneys Bharara and Fishman praised the outstanding efforts of the FBI’s New York Joint Terrorism Task Force, which principally consists of agents from the FBI and detectives from the NYPD, and the FBI’s New Jersey Joint Terrorism Task Force. The prosecution in the Southern District of New York is being handled by Assistant U.S. Attorneys Nicholas J. Lewin, Emil J. Bove III, Andrew J. DeFilippis and Shawn G. Crowley, with assistance from Trial Attorney Brian Morgan of the National Security Division’s Counterterrorism Section. The prosecution in the District of New Jersey is being handled by Assistant U.S. Attorneys Dennis C. Carletta, Francisco J. Navarro, Margaret Ann Mahoney and James M. Donnelly, with assistance from Trial Attorney Brian Morgan of the National Security Division’s Counterterrorism Section. The charges contained in the complaints are merely accusations, and the defendant is presumed innocent unless and until proven guilty.